@BifBangPow: "Donny, you're out of your element!" Ah, who could forget those immortal words spoken by Walter in 'The Big Lebowski'? It's only one of the best lines in the film, and one we at the Bif Bang Pow! offices are proud of quoting on a near daily basis. 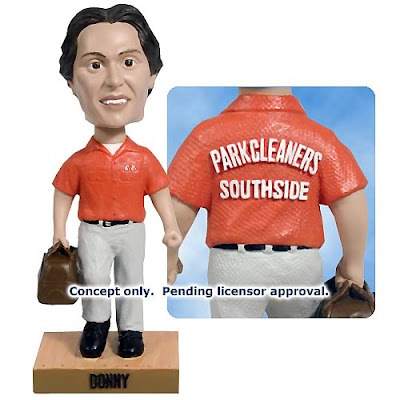 And we have even more reason to celebrate it now, as we finally have a little three dimensional Donny to call our own. Yes folks, after a long gestation period, the late, great Donny Kerabatsos is going to be available as a brand new bobble head, the first new character we've added to our 'Big Lebowski' line up. We've captured his oblivious optimism perfectly, and think he'll make a fine addition to your growing collections. He's available right now for pre-order, so what are you waiting for? Our Dude bobbles have been going like marmots in heat, so if I were you I wouldn't dilly-dally. There's lots more brewing at BBP! for 2008, the Official Tenth Anniversary of 'The Big Lebowski', so stay glued to this spot. Or as Donny would say, "I am the Walrus".